Do you need a bigger file? The file available on this site is 643 x 1024 px. To obtain an alternate file type or higher resolution copy, please contact the owning institution. Scope/Content: Groundbreaking ceremonies for the addition to the Library took place, April 5, 1968, sponsored by Friends of the Library. 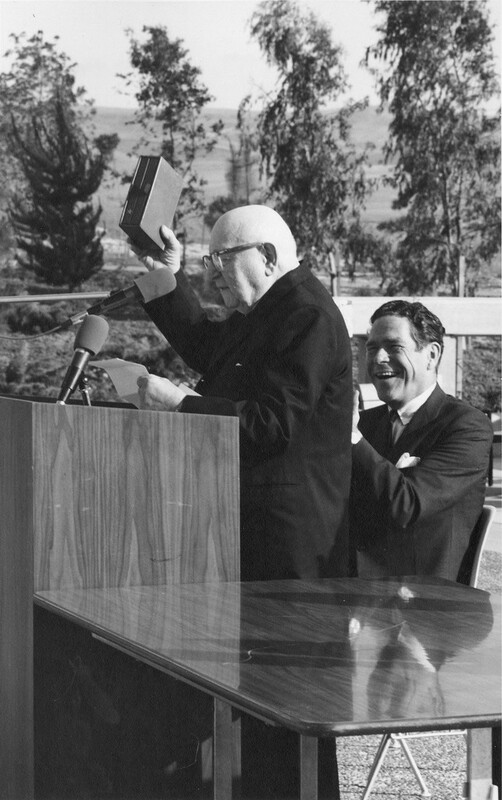 Dr. Kroch at speaker's rostrum is applauded by John A. Wright, President of Friends of the UCI Library. Original: 11x7" black-and-white photographic print.